Santorini (or Thira) is a picturesque island with the iconic blue and white houses contrasting the ocean. Located in the southern Aegean Sea it was the remains of a massive volcanic eruption that destroyed the earliest settlement on the island. Santorini is a perfect getaway with stunning views over the cliffs and some of the amazing sunsets in the world. It is the ultimate R&R (rest and relax) and here are 5 things to know about Santorini to make your stay even better! 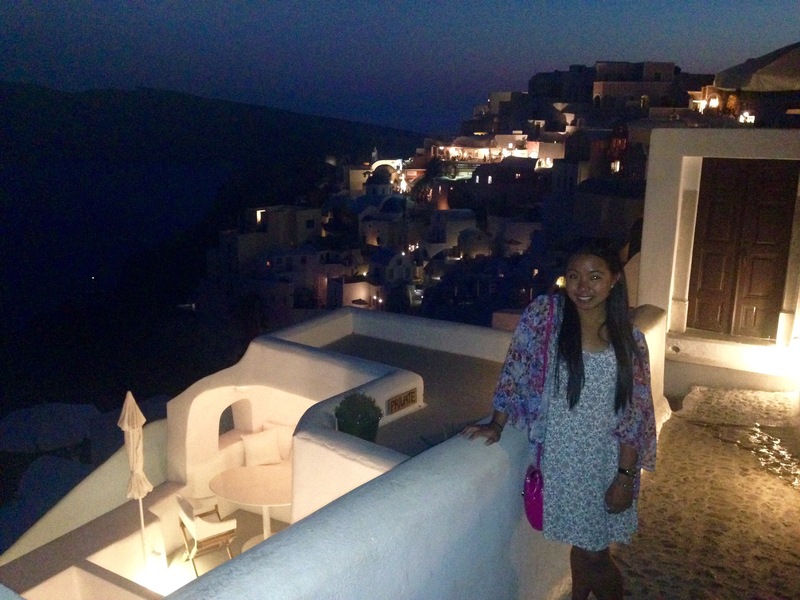 Santorini has many “villages” but the question is where to stay? Basically, the sum it up Fira is the main city where most of the nightlife occurs but you do get a mix of churches and museum. Oia is located north of the island and is perch of the cliff and is most famous for the sunset. Kamari is a popular beach area towards the east and not too far from the airport. Perissa is located down south and has some of the best black beaches in the world! Another note is that Fira and Oia can be extremely hilly so prepare for those leg days! Also getting from one place to another can be quite far, getting from Perissa to Oia is a 30 minute car ride. Santorini has a wide range of accommodation types to choose from such as hostels, hotel, and Airbnb. The good thing is there is always an option and budget for you to choose from! Personally, I did Airbnb in Perissa which was in a villa setting with a lovely pool overlooking the mountains. Bonus it was on a student budget, yay! So make sure you do your research and you can find those precious gems to call your home in Santorini! Santorini is not the best when it comes to transports. The only public transports are buses and they are not regular or “reliable”. Other options include hiring out cars, quad bikes, motorbikes or scooters. Surprisingly hiring out cars are quite easy and affordable compared to the rest of Europe. Make sure you look around at a few places before hiring out a car as there is plenty of competition. Santorini may seem to be small but it does take time from getting one side of the island to the other. Driving conditions are not the best as they are quite hilly and a lot of curve/bends along the mountain. In Fira and Oia you can even take a cheeky donkey ride if you are up to it! Greek food? YES PLEASE! Explore your options, have a look at trip advisor, talk to the locals and wander around. Always try to go local but don’t be lured away by dinner with a “view”! Santorini is definitely one of the best places to take amazing photographs, so do yourself a favour and wander off through the alleyways and smaller paths. How to get to Santorini? Depending on where you are located, you can either fly into Athens then take another flight into Santorini. Aegean Airlines has many flight routes between Athens and Santorini and the bonus its part of star alliance, yay to points! Some cities within Europe offers direct flights into Santorini. I flew from Rome into Santorini with Vueling Airlines (budget airlines). However, some Vueling flights arrive in the early hours of the morning so be prepared! The dreamy white and blue rooftops of Santorini would make a perfect relaxing getaway. The negatives can be the crowded tourist but rest assured there are plenty of other areas to explore and to get away from the crowds. Thank you so much for putting this list together. Will definetely come in handy when I will go there and you took some really beautiful pictures!